Complex, Exquisite The first spiced rum I've had with a notably unique flavour profile. Vanilla and standard spiced flavours accented with prominent notes of cinnamon. Very smooth, very oaky Similar in taste and style to a Ron Zacapa. Hearty oak body with subtle vanilla undertones. An elegant delicacy. Hinging on a 9 Lacking in depth, but very very smooth. Light banana and nouget tones on the back of the tongue. Definitely an exquisite sipper. Best mixed Potent first taste ripe with alcohol infused sugar. Leads to a caramel rich after taste. 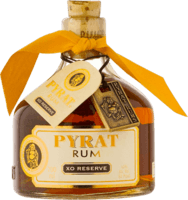 One of the best rums in my collection when mixed with Coke. Maybe a bit generous Lacking in complexity, but definitely a certifiably tasty spiced rum. Very deep, dark caramel flavors with a hefty mid-range flare. Very tasty As a pure sipping rum, this is absolutely delicious. Very hefty tones of coconut and cocoa. Not much of a burn on the throat. A tasty treat. Very sweet, smooth. A sweet, almost tart forefront. Washes out to a fruity, banana finish. Quite tasty, blends phenomenally with just a splash of cola. Unique chocolate taste Carries a deep cocoa, chocolate, almost coffee flavour. Tasty, something new. Cognac overtones wash through to vanilla, nougat aftertastes. Amazingly smooth, a definite sipper. Worth the cost to a T.
Smooth, light flavour Very simple flavours, light caramel and fruit notes. Not much else to say. Like a lighter kraken. Hefty tropical theme Hearty amounts of Banana flavor on the forefront with a tasty caramel finish. Definitely a simple sipper if so inclined, functional as an easy mixer.